How Preksha Dhyan can help in cancer? Picture shows Rashmi bhai receiving the Victor award from Ms. Vandana, Founder, V Care Foundation, Mumbai, India. Since the dawn of history, mankind has been haunted by a disease that has remained largely incurable – cancer. For almost a century, this disease has been the target of an investment business – the pharmaceutical industry – that has turned this epidemic into a multi-billion dollar business. The outcome was predictable: Today, at the beginning of the 21st Century, cancer is spreading globally; for most types of cancer the annual death rate still increases and the skyrocketing costs are financially ruining millions of cancer patients and strangulating the economies of entire nations. My brother Rashmi Bhai Zaveri was diagnosed as having CANCER - 'Non-Hodgkins Lymphoma' in the year 1999. After removal of cancer cells, he underwent full treatment of Chemotherapy (6 cycles) and 12 radiations by Dr MB Agarwal who is an eminent Hemato-Oncologist. Was he cured by meditation? No. He conquered FEAR! “I also consulted my Guru Acharya Mahapragya and my brother Jain Muni Prof. Mahendra Kumar, I was advised not to panic but practice Preksha meditation along with medication. They prescribed scientific method of meditation, relaxation and positive thinking. 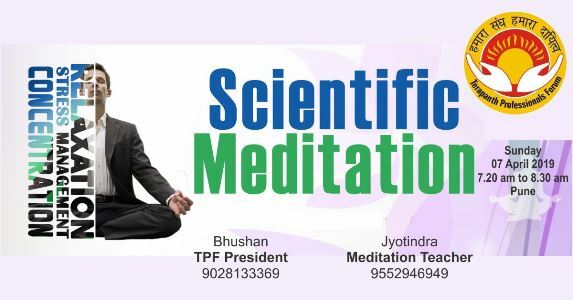 Their blessings gave me tremendous mental power and POSITIVE attitude The medication coupled with meditation showed positive result and I was completely cured of cancer in 6 months. But my body was shattered due to side effects of chemo I was 65 years OLD at that time, but looking much older and weak But with faith and determined positive efforts I recovered fully in one year. I was mentally broken down, and I emerged VICTOR DUE TO POSITIVE MEDITATION. I am now 80 years YOUNG, full of vigor and energy. I give emotional support to cancer patients My message to them is: ‘Don't Panic. Conquer Fear Never think of ending your precious Life Never give up or DESPAIR-OR THINK NEGATIVE THAT WILL WEAKEN YOUR MENTAL AS WELL AS PHYSICAL POWER TO FIGHT’. The powerful WILL to LIVE and fight illness will send positive message to your cells.